Spring hiking in the Smoky Mountains is the perfect combination. May is one of my favorite months to hike. The beginning of June can be nice too. I recommend mid-May through early June. During the day, temperatures are mild. Low 70s to mid-80s are the norm. At night, it's cool. You won't have to bundle up too much for weather in the mid-40s to high 50s. Why is spring hiking in the Smokies my top choice? *beautiful weather- it's cool and refreshing, not freezing cold! 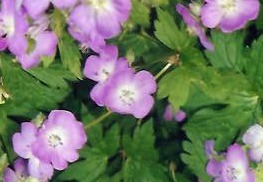 *gorgeous wildflowers- flowers blooming in spring include mountain laurel, flame azalea, and rhododendrons. About 1,500 types of flowering plants reside in the Smokies! *peace and quiet -beat the crowds- most visitors start rolling in mid-June through mid-August. July is the most crowded. There are lots of beautiful wildflowers to gaze at in the spring. One of the most interesting is the lady's slipper. What's neat about it is it looks just like it's name. 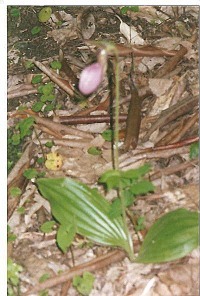 Lady's slipper can be pink or yellow and blooms April-July. So keep on the lookout and you might find one on the trail! While spring is the best season to hike, it has the most changeable weather. Keep in mind that elevation is a big factor in temperature. The higher you go the colder it gets! the highest point in the Smokies-the elevation is 6,643'! In May the average high is only 57º with a low of 43º. Luckily for you, it's a short hike to get there. If you're hiking in the spring, check out my list of wildflower hikes.